A huge Thank You to Lynne, of Honeymuffin for picking the perfect Tuesdays with Dorie recipe to break in the month of October. 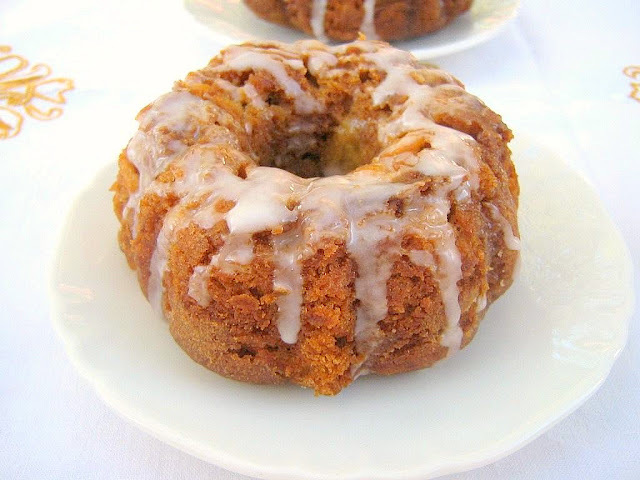 Not only was this recipe dripping with the essence of autumn, but it also allowed me to use my beloved mini-bundt pan! And while I'm sure that it was equally delicious in it's full-bodied bundt cake form, I think the small versions were just right. For some reason, compact versions of desserts always taste better to me. As though the flavours are so tightly concentrated that they're almost bursting at the seams. Plus, when a recipe is divided or quartered, there isn't too much of it left over to nosh at 2am. This is the perfect recipe to gracefully usher in the month of October. It's filled with apples and spice and a delicious companion to a mug of hot cider or dark coffee. For the complete recipe, please visit Lynne's gorgeous blog by clicking here. Thank you, Lynne! I really must invest in a mini bundt pan. 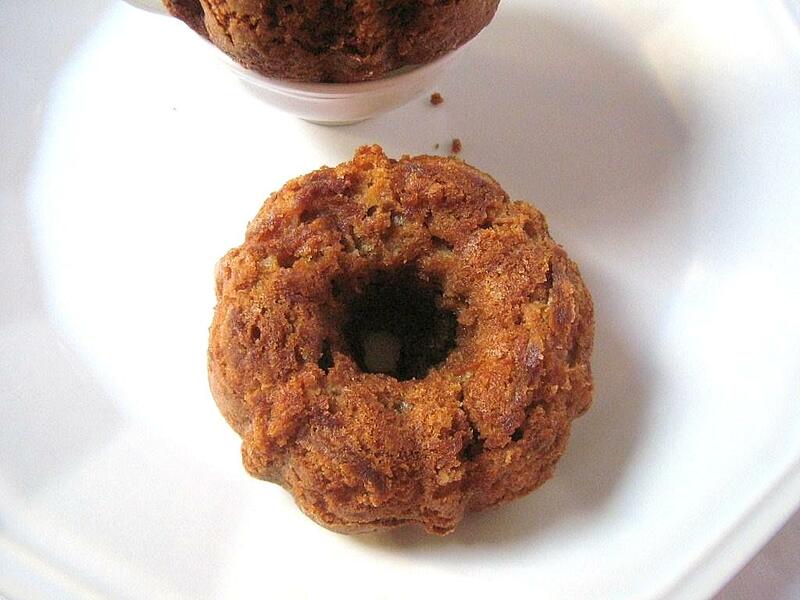 Yours look adorable, and this is a perfect autumn recipe. How long did you cook the mini bundts? Your little bundts are gorgeous! I'd love a mini bundt pan, I think I'll have to ask Santa for one this Christmas! The glaze looks so pretty. I love mini bundts too. This was one great cake. I agree with you this cake is perfect to welcome Oct. and the fall months ahead!! Your cake is looking great..I made minis too! I couldn't agree more...what a lovely way to bring in the Fall. Thanks for baking along this week!! Very cute! I missed making this in the frenzy of moving, but I have finally unpacked most of my kitchen stuff. I'll take one with glaze while I finish unpacking, please. FYI, I recently made chocolate chip cookies using Cook's Illustrated Perfect Chocolate Chip Cookie. These are not That unhealthy. Compared to other desserts, they're quite yoga friendly. :~) And if you keep them well-wrapped, they actually improve flavour-wise. I think you could safely keep them tightly covered at room temperature for 3 days. I'm sure you could freeze them too, just be sure they're in an air-tight container. This cake was certainly perfect for fall. Yours look great. Moist? 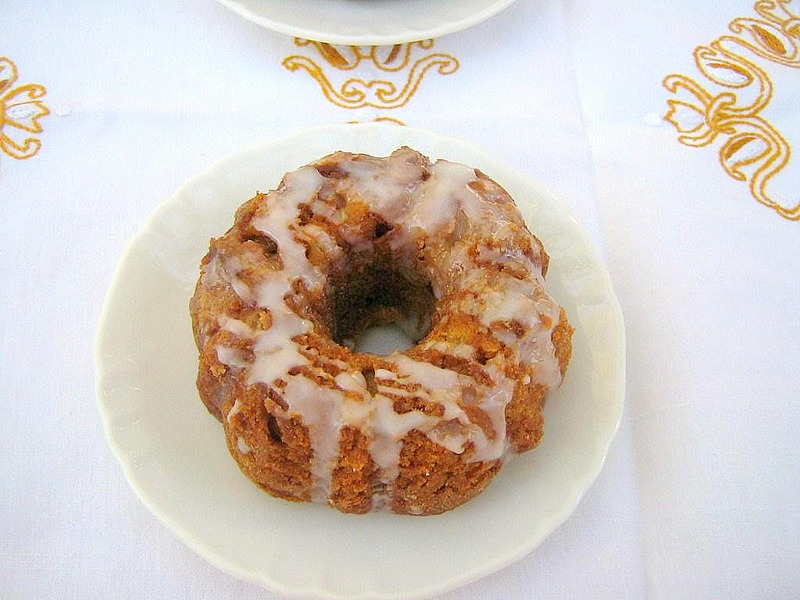 You should try a full size bundt. That thing weighs a ton! :) Mini's are more manageable. They're stunning! As well as cute. And I agree - mini pans are a bear to clean... I use a toothbrush (an old one) and my kitchen sprayer up close. But enough about cleaning - glad you enjoyed them - that recipe is a keeper! I made this cake yesterday in a full-sized bundt pan and I doubled the cinnamon and omitted the raisins and nuts. SO GOOD! The cake is unbelievably moist and tender. I love cinnamon, so I will probably add even more cinnamon next time (and there will definitely be a next time!). Thanks so much for the beautiful, delicious and easy recipe! As a fellow cinnamon lover, your recipe twist sounds delicious! I'm so glad you enjoyed the cake.